Destiny: Rise of Iron tells the story of the Iron Lords, who previously served as hosts of the Iron Banner weekend tournaments in the game. There's a lot more to them than that, though, as years ago they were on the front lines against a major threat from the Fallen when that enemy faction tapped into the dark power of a resource known as SIVA. The Iron Lords won the day, but at a great cost that left the Iron Lords decimated as an order. However, they didn't end the threat, but merely forced it dormant and now it has returned. You have been chosen as the Guardian who must face the new threat, and if you succeed your place among the Iron Lords will be assured. With a setup like that, you might think that Rise of Iron would provide a single player campaign on the same order as the one that came with The Taken King expansion. Unfortunately, that's not the case here. Rise of Iron features a memorable opening mission, an exciting final mission, and just a few filler missions in between. You will get through the whole thing within a few hours - if you block off some time one evening you'll easily get through it all in a single play session. For an extended look at the campaign's opening mission take a look at my hands-on article here, but in short it's an exciting battle as you fight your way up a frozen peak, riding a gondola and walking along knife-edge ridge lines as you make your way to the Iron Lord's Temple which sits at the peak's summit. As I write this, I can remember that opening mission vividly as well as the battle in the closing mission, but I'm hard-pressed to remember much of what happened in the handful of filler missions that came in-between. It feels like there's the potential for more story here, but that it's not fully exploited in the campaign and the whole thing feels like it comes up short - especially following in the footsteps of the much longer campaign in The Taken King. 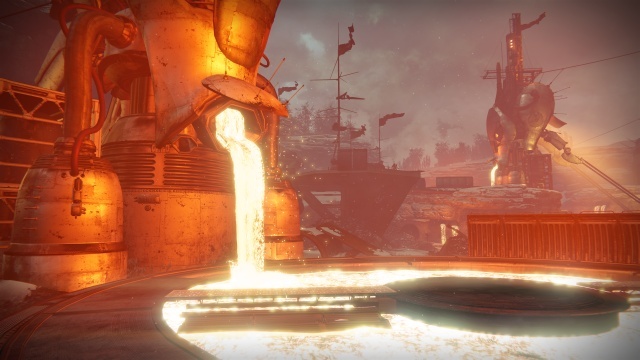 Like The Taken King, Rise of Iron brings a new zone to the game, the Plaguelands. 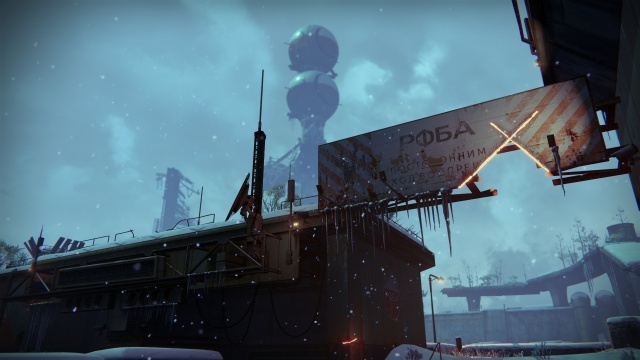 The Plaguelands is set on Earth in Russia and is aesthetically an extension of the Cosmodrome with the addition of pulsing red SIVA nodes littering the landscape. The Plaguelands is dominated by two primary areas, the first featuring a beached cargo ship next to a dockyard filled with cargo containers, the second a volcanically active area dominated by lava-spewing volcano. That volcano is home to Archon's Forge, a multiplayer event zone that features arena style battles. The battles are initiated by inserting a key into a control panel that sits just outside the arena, and once this is done a wall forms across the entrance to the arena. This prevents new players from entering once the battle begins, and any players that are not revived in time within the arena will respawn outside the wall and miss the rest of the battle. Those who survive the battle will be rewarded with the loot that litters the arena floor after the fight. The Plaguelands is also home to a new social hub, the Iron Temple on Felwinter Peak which was liberated in the campaign's opening mission. This is the new home of the Iron Lords, and the new location to pick up Iron Banner quests and gear rewards during those events. There are also quests that can only be obtained at the Iron Temple that can be completed within the Plaguelands zone. The Iron Temple is only available to players that purchase the Rise of Iron expansion, but you'll still need to visit the Tower and Reef as Xur never comes to the Iron Temple and there are no faction representatives there, either. Rise of Iron also includes two new strike missions: The Wretched Eye and Sepiks Perfected. Sepiks Perfected is the new version of The Devil's Lair strike, which if you've played before you'll remember ended in a battle with Sepiks Prime. The Wretched Eye is a new strike that has your fireteam investigating the source of an army of Hive being controlled by Splicers, Fallen made more powerful with an injection of SIVA. Facing Sepiks at the end of the Sepiks Perfected strike is challenging because the battle takes place on a loading dock platform that doesn't give you a lot of room to maneuver. There are crates on the dock that can be used for cover from Sepiks' attacks, but a steady stream of Fallen reinforcements will keep flushing you out and force you to fight them at close quarters. The Wretched Eye ends in a battle with a Splicer Priest, Kovik. When you first enter his chamber all that you will see is a massive Ogre with spiked balls for hands tethered in place in the center of the chamber. Don't waste your ammo on the Ogre, though, as it is invulnerable to attack. Soon your real target, the priest, will appear and you'll have to contend with him. Kovik is powerful in his own right, but he quickly complicates matters by releasing the Ogre and then calling in Splicers and Hive to attack your fireteam. The battle is pretty intense as you not only have to contend with Kovik and his minions, but you have an enormous invulnerable battering ram let loose into the mix. It's a great test of your situational awareness as you try to keep track of where all of the threats are at any given moment. Rise of Iron adds a new multiplayer game mode called Supremacy, a mode introduced with the words: "Defeat your opponents, take their crests". This mode owes a lot to Call of Duty's Kill Confirmed mode in that players drop crests when killed, and the crests need to be collected to get credit for those kills. If the enemy team grabs a crest first, then you won't get any credit for the kill. In Destiny's version of the mode, picking up a crest from an enemy player scores two point for your team, one point is credited to the player making the pick-up and the other to the one who made the kill. Collecting a fallen teammate's crest will score a point for your side. The first team to 150 points wins the match. 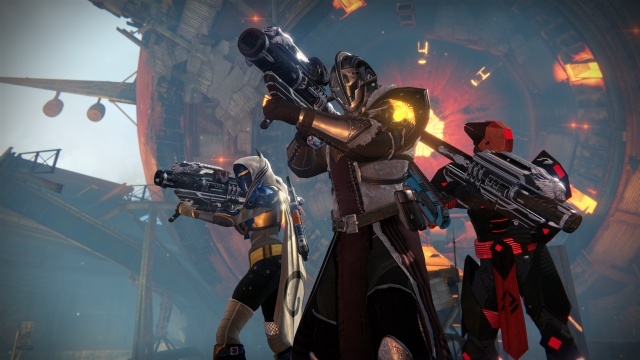 Supremacy in Destiny is like a combination of Team Deathmatch and an objective based mode. Since you can see the location of crests, firefights that result in a couple of crest drops that aren't picked up right away act as a magnet for other players as they converge on the crests. More players means more crest drops, which in turn pulls in more players. The last standing get to clean-up the crests and things spread out for a bit until it all happens again. Supremacy is enough of a change of pace from the other modes that it's a good addition to the game, adding more variety to the options available to players who frequent the Crucible. The two new maps coming to Destiny are Last Exit, set in Ishtar Sink, Venus, and Skyline, set in Meridian Bay, Mars. While both set at Golden Age Off World Transit centers, each of these two maps has its own distinct character. Last Exit has small open areas outside the center, while the central structure resembles a subway station. There are two natural chokepoints at the aboveground entrances that lead down to the station area, one of which features another tactical twist in that it is too long and steep to provide a sightline from top to bottom. Underground there is a maze of tunnels, as well as some train cars that can either provide cover or force players into some very tight quarters. Skyline has a very different feel to it as it features large exterior and interior spaces. The transition spaces between indoors and out provide for some chokepoints, though, and require that you pass through two sets of closing doors to cross between areas. The open spaces are broken up by crates and other objects, so there's a decent amount of cover and a number of options for crossing the spaces and flanking your opponents. Lastly, Rise of Iron brings a new raid to the game, Wrath of the Machine. The raid is both challenging and enjoyable, requiring players to work together to solve puzzles in addition to facing the inevitable boss battles. It's also the best way to get the gear necessary to push your light level towards the new max level of 400, although you'll need to reach 380 first to partake in the raid. Rise of Iron seems to be in no hurry to help you get to the new maximum, regularly doling out gear that's within a point of your current light level. Pushing your light level higher is a grind of getting enough gear to push your light level up a point, at which time you'll start to see gear that's a point or two higher. It's designed to keep you playing for a while before you max out your light level, but the result to you as the player is that it will be an at times frustratingly slow march towards the max level. Overall, it's disappointing that the campaign is so much shorter than that of Taken King. Outside of that, you get about the same amount of new content with Rise of Iron that you did with Taken King. Taken King felt like more of an expansion, though, perhaps because the Dreadnaught was significantly different than any other zone in the game, while the Plaguelands feel like an extension of the Cosmodrome. For an expansion that costs as much as a new game, Rise of Iron doesn't deliver enough content that is truly fresh and new. Destiny players will enjoy some of the new content, but will probably be left feeling like there should have been more to Rise of Iron. Final Rating: 78% - An expansion that's not as expansive as The Taken King.